Provide comfort for the family of Ferne Snook with a meaningful gesture of sympathy. 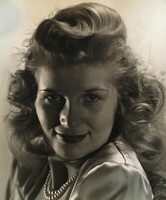 Ferne Darlene Snook, 92, died peacefully Saturday evening, March 23, following a brief battle with pancreatic cancer. Born October 8, 1926, to parents Clair and Mina (McBride) Biddinger, she lived her entire life in Ashland and was a 1945 graduate of Ashland High School, serving as the class’ secretary for 50 years following graduation. She was preceded in death by her husband of 72 years, William E. Snook, Sr., who died November 17, 2018. Starting as a teenager during World War II, Ferne made her life’s mission one of volunteerism, working for charitable causes and helping those in need. She recently was honored by Samaritan Hospital for her 65 years of service volunteering in several capacities. She spent the past 43 years at the reception desk and she also once served as the surgical hostess at the hospital. She also volunteered for 10 years at Brethren Care Nursing Home. Mrs. Snook also was honored in 2015 as the Outstanding Senior Citizen of Ashland County for her lengthy record of volunteer service to the community. Her mission to give back to the community began at an early age, spending weekends in Crestline, Ohio, from 1942-45, as part of the World War II effort at home. “When I was 16 years old, my best friend Betty (Sweet) Morr and I would ride the bus to Mansfield every Saturday and Sunday with the Eagles Club and then someone who drive us to Crestline where we would pass out apples and sandwiches to the troops on the trains that would stop at the depot,” she recalled. Following graduation from AHS, she also became employed at A.L. Garber Company, where she met the love of her life, “Ed” Snook, who had just returned home from the war. They were married on June 30, 1946. In 1950, she began working for the Ashland Red Cross’ Blood Bank drive. She also worked at the Ashland County Fair for more than 40 years and for the Ashland County Board of Elections for more than 30 years. She belonged to several bowling leagues at Ashland’s King Lanes throughout the 1960s and ‘70s and also enjoyed participating in many bridge and card clubs throughout the years. Like her husband, she was an avid sports fan, especially of the Ohio State Buckeyes, Cleveland Indians and Cleveland Cavaliers. Mrs. Snook was also preceded in death by brothers Paul (Helen) Biddinger and Neil (Martha) Biddinger and sister Florence (Daniel) Richards. She is survived by the couple’s three children: Rebecca (James) Shank of Tiffin, Ohio; William E. (Beverly) Snook, Jr. of Ashland; and Jeffrey (Amy) Snook, of Atlantis, Florida; seven grandchildren: Danielle Clady, Melissa Bowers, Michelle Kurtz, Jared Shank, William E. Snook, III, Savanna Snook and Dillon Snook; and 11 great-grandchildren. Funeral services will be held Wednesday, March 27, 2019 at 2:00 p.m. in the First Christian Church with Pastor Rich Pate officiating. Interment will follow in the Ashland Cemetery. Friends may call one hour prior to the service from 1:00 p.m. to 2:00 p.m. in the church. In lieu of flowers, memorial contributions may be made to First Christian Church, 1425 King Road, Ashland, Ohio 44805. To send flowers in memory of Ferne D. Snook (Biddinger), please visit our Heartfelt Sympathies Store. We encourage you to share your most beloved memories of Ferne here, so that the family and other loved ones can always see it. You can upload cherished photographs, or share your favorite stories, and can even comment on those shared by others. Provide comfort for the family of Ferne D. Snook (Biddinger) by sending flowers.